I have extracted my SMS messages from my old Motorola Atrix 2 and have them saved in both nbu and ipd files. I tried copying the nbu and ipd files to my new iPhone 6 but it doesn't work. Is it possible to transfer the SMS messages to my iPhone from Motorola? I want to have these messages in my SMS inbox? Your good ideas or suggestions will be greatly appreciated! It seems extremely simple to transfer media files, including music, photos and videos from a Motorola mobile phone iPhone. But things can be a little bit confused when you attempt to transfer special phone data like contacts and text messages. Take contacts for example, such type of data is located in the internal memory space of a phone,they can not be accessed and extracted from a mobile phone directly, let alone transfer them to another device. On the other hand, change phones is a common phenomenon nowadays, which makes it essential but troublesome to transfer your contacts to the new phone. You need a way out! Let's introduce an effective solution to help you realize the transferring task. Before you start the transfer, you may need to freedown a phone contacts transfer tool to help you. The Motorola to iPhone Transfer is a specialized phone to phone data transfer, which is specially designed to help you transfer contacts from Motorola to iPhone, or move contacts to Motorola from iPhone with 1 click. In addition to contacts, Motorola to iPhone Transfer can also copy other phone information, such as text messages, photos, videos, music, apps, call history and so on. Moreover, it not only copy phone numbers, but also 100% keeps other contact information, like company name, job title, email address and so forth. Now, let's begin the task to transfer contacts between Motorola Atrix/Charm/Droid and iPhone 6/6 Plus/5S/5/4S. 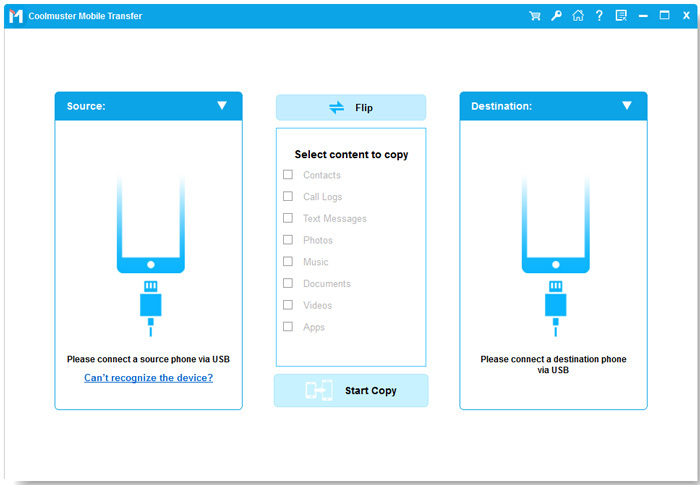 First of all, you should free download the Motorola & iPhone transfer app on your computer. How to Move Contacts (Phone Numbers) from Motorola to iPhone 6/5S/5? 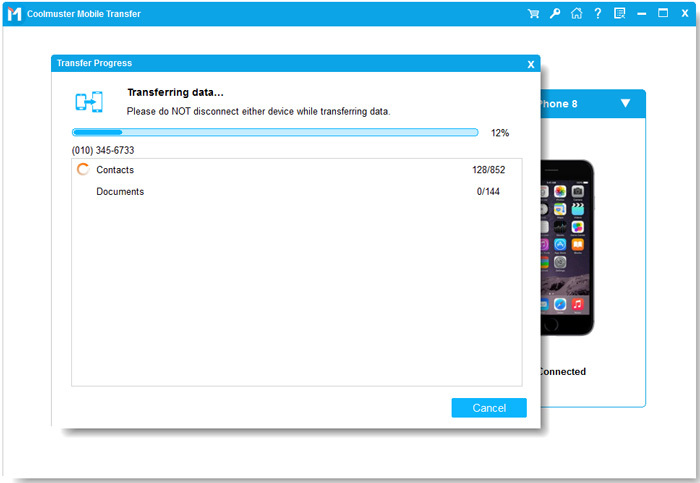 After downloading the Motorola to iPhone contacts transfer app, install and launch it on your computer. Then, you will see the picture below. Just click "Phone to Phone Transfer" -> "Start" buttons to go to the next step. Next, you need to link your devices to the computer at the same time. After they have detected by the app, you will see the Motorola phone is displayed at the "Source" and iPhone at "Destination", that means the contacts will be transferred from Motorola phone to the iPhone. If you have placed them wrongly, you can click the "Flip" button to change iPhone at the "Source". Last step, uncheck other file types that you don't want to transfer. Only mark "Contacts" and click the big "Start Transfer" button to begin the contacts syncing process. When the transfer finishes, you can end the transfer and go to the target phone to see the exported contacts. Make sure to connect your Motorola and iPhone with your computer all the time. 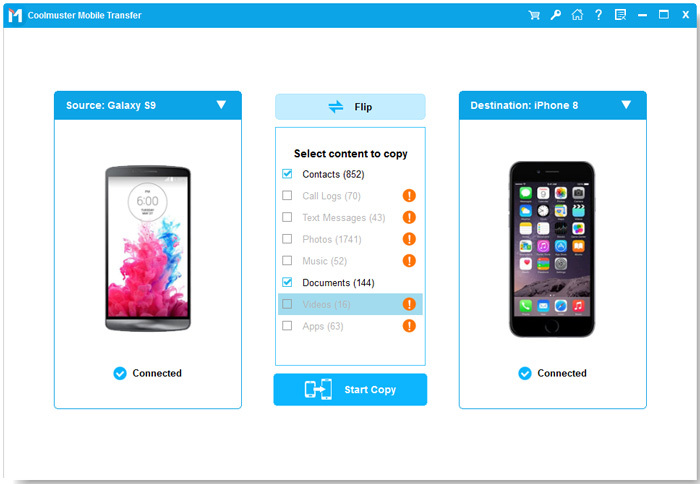 After successfully transferring phone contacts, why not use this app to copy more other data like text messages, photos, music, videos, call logs, apps, etc. between any Android, iOS, Symbian and BlackBerry phone?